Transparency Market Research (TMR) states that the competition in the global veterinary ultrasound scanners market is likely to intensify in the coming few years. Some of the leading players such as Samsung Medison Co., Ltd, Esaote SpA, Shenzhen Mindray Bio-Medical Electronics Co., Ltd, and BCF Technology Ltd are expected to focus on emerging economies to expand their businesses in the near future. Furthermore, growing focus on developing better handheld devices is also projected to support the market’s growth in the near future. Companies are also projected to develop budget-friendly machines in order to appeal to a wider subscriber base in the foreseeable future. 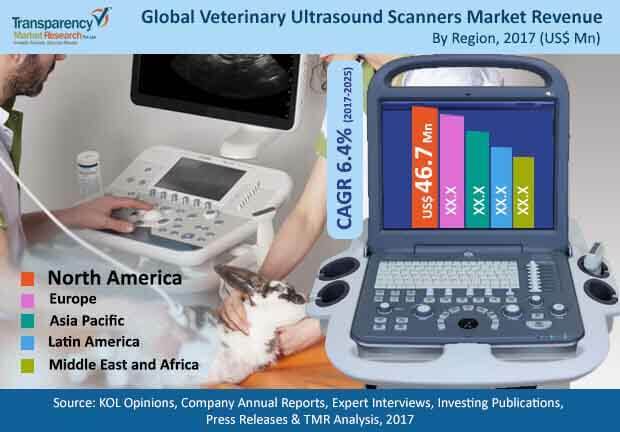 According to the research report, the global veterinary ultrasound scanners market is likely to be worth US$179.4 mn by the end of 2025 from US$ 103.0 mn in 2016. During the forecast period of 2017 and 2025, the global market is poised to surge at a CAGR of 6%. Out of the various products, the global market will be led by portable/handheld ultrasound scanners due to the convenience they offer. Meanwhile, developing countries of Asia Pacific are expected to keep this regional market at the forefront throughout the forecast period. Veterinary ultrasound scanners are used to get a clear picture of animal. The ultrasound scanners are said to be one of the rewarding techniques since they have many advantages such as non-invasiveness, innocuous, and often portable. Veterinary ultrasound scanners are not only used for reproductive purpose, but can be used for several applications like musculoskeletal, abdominal, cardiology and other diagnostic and interventional purpose. The global veterinary ultrasound scanners market is witnessing a significant growth and is expected to expand at substantial CAGR during the forecast period of 2017–2025. Increase in world meat export and meat consumption, injuries to animals due to various kind of animal sports, increase attachments towards pets and exotic animals has impact on global demand for veterinary ultrasound scanners. The market is also being supported by the growing ownership of companion animals and livestock. The increasing inclination toward owning a pet, whether a well-bred animal or an adopted stray, has had a positive influence on the overall market. Analysts anticipate that growing number of veterinary clinics are also projected augment the growth of the market as it means that there will be a rise in the number of practitioners focusing on the well-being of animals. Growing expenditure on pet healthcare and well-being of livestock due to emotional or financial needs has also been identified as a key growth driver for the overall market in recent years. On the flip side, the global veterinary ultrasound scanners market is likely to be discouraged by the lack of awareness amongst a wide global population. The poor rate of awareness about animal healthcare in developing countries is restraining market growth. Furthermore, the consistent demand for X-ray machines as compared to ultrasounds in emerging economies due to lack of technological know-how is also projected to hamper the market. The negligible support from government schemes in certain countries has also been identified as a threat to the market. This review is based on Transparency Market Research’s report, titled “Veterinary Ultrasound Scanners Market (Product - Portable/Handheld Ultrasound Scanners and Cart Based Ultrasound Scanners; Imaging Technology - Digital Imaging Technology, Analog Imaging Technology and Contrast Imaging Technology; End User - Veterinary Hospitals, Veterinary Clinics and Animal Breeding and Farms) - Global Industry Analysis, Size, Share, Growth, Trends and Forecast 2017 - 2025”.